In one of the best matchups of the week, the resurgent Washington Redskins take on the undefeated Kansas City Chiefs on Monday night. 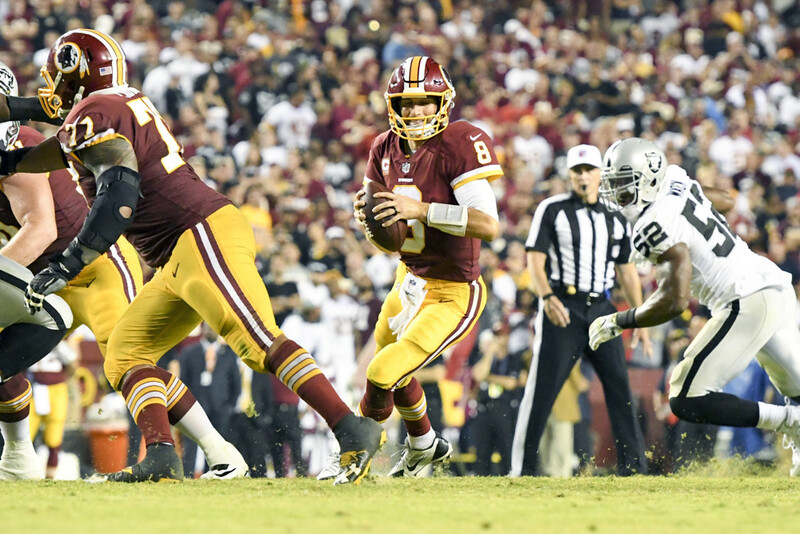 The Redskins looked lost in their week one matchup against the Eagles, but have since looked dangerous, culminating in a total dismantling of the Raiders last week. Kansas City has looked to be one of the NFL's best, and looks to slow down the Redskins high scoring attack. Look for a more defensive battle in this one, where big plays will win the day. After disappointing fantasy outputs the first two weeks, Kirk Cousins exploded with a twenty six point day against a previously impressive Oakland defense. Playing in Arrowhead against an opportunistic Chiefs defense should provide some pause, but if he is your only option, you could do worse. Start him as a low upside QB1. If you knew that Chris Thompson would be the number three fantasy running back through three weeks, congratulations, you are the only one. After blowing up the Rams, Thompson ripped off multiple big plays against Oakland in route to another huge day. He probably won't continue to see this many touches, but still offers a solid RB2 prospect in a tough matchup due to his pass catching prowess. Jordan Reed simply cannot stay on the field. He remains day to day with a chest injury and still is nursing the broken toe that has limited him from the beginning of the season. Vernon Davis put up good numbers in his place which means that the Redskins will probably take it easy with Reed. If he does play he immediately becomes a TE1, but monitor the situation closely. After a promising week one start, Pryor has been very quiet, collecting a total of four catches for 50 yards. The low target total of eight in the past two weeks should be the biggest concern as Kirk Cousins has looked elsewhere for his completions. Pryor still offers a flex option but doesn't inspire much confidence for week four. Jamison Crowder has been consistently unspectacular so far this year. He's been Kirk Cousin's favorite target, but has yet to top 52 yards and inexplicably has two fumbles. With feared corner Marcus Peters likely blanketing Terelle Pryor, it's likely that Crowder has a better day, but he still is more of a flex option than a WR2. Better known for dinking and dunking the ball down the field, Alex Smith currently sits fourth in yards per attempt and has the highest quarterback rating in the league. Sports can be weird. Anyway, Smith has emerged as a solid streaming option and can be trusted again against a mediocre Redskins defense. There isn't really much else to say about this all world rookie. He has the second most scrimmage yards through three weeks in league history and has to have one of the highest fantasy outputs through three weeks since fantasy football was created. The Redskins have been good against the rush this year but were unimpressive in 2016. None of that really matters though, start Kareem Hunt. Tyreek Hill is one of the most dangerous offensive players in the NFL, full stop. He still relies on big plays for his fantasy outputs, but Andy Reid is committed to getting him the ball and moves him all of the field to do so. He has a lower floor than other top flight wide receivers, but Hill is a WR2 that can win you a week. The Chargers all but eliminated Travis Kelce from the Kansas City offense last year, but it was a dedicated effort that opened up other options. The Redskins, a team that is allowing the most yards to tight ends this season, won't be able to replicate this magic. Kelce is a TE1 with a big score potential. The Chiefs boast 4 very startable offensive fantasy options and then the list becomes Albert Wilson or Chris Conley. So here we have it, your first defensive preview. The Redskins went off last week, and look like a dangerous matchup, but the Chiefs already have four picks on the year and offer a top 12 option at home.